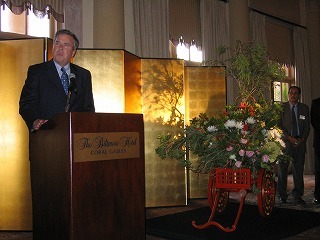 2006, Former Governor Bush at a reception for the Wakayama Delegation hosted by the State of Florida. 2006, Former Florida First Lady Columba Bush with Former First Lady of Wakayama Prefecture, Mrs. Kimura. 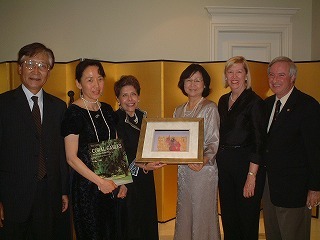 2006, Former Florida First Lady Columba Bush with Former First Lady of Wakayama, Ms. Kimura, Consul General & Ms. Masakazu Toshikage and Coral Gables Mayor & Ms. Don Slesnick at a reception hosted by the Consulate General of Japan. 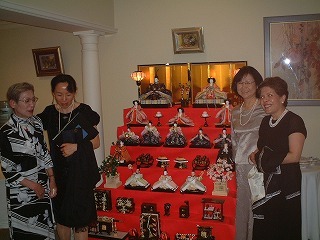 2006, Former Florida First Lady Columba Bush with Former First Lady of Wakayama, Ms. Kimura and Ms. Toshikage, with a Japanese doll display. 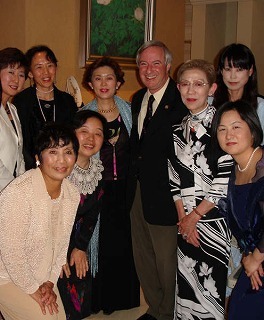 2006, Coral Gables Mayor Don Slesnick with the Wakayama Delegation. Wakayama Prefecture faces the Pacific Ocean, and is located in the southwestern part of the Kii peninsula which is the biggest peninsula in Japan. It has beautiful nature and historical treasures. With beautiful green mountains and a wonderful coast line whose length is 600km. There is a beautiful river between the mountains and the sea. The gorgeous scenery in Wakayama attracts visitors year-round. Kumano sanzan and Koyasan have awed people for ages and were granted World Heritage status. The mild climate and richness of nature provides gifts from the mountains, river and sea. Wakayama is rich in tourism resources and products. About the Sister-State Relationship The Sister-state relationship between Florida and Wakayama was formed in 1995. The State of Florida and Wakayama have been committed to strengthening friendship and mutual understanding while increasing economic, trade, social and cultural developments. Their efforts can be seen on the timeline below. Florida hosted Mrs. Kimura, former First Lady of the Wakayama Prefecture , and members of the Wakayama Chamber of Commerce and Industry Women’s Business Council, and Mr. Hakuzan Kubo, Noh Mask Carver, in celebration of the 10 year anniversary of the signing of the Sister-State Agreement. While in Florida, Mrs. Kimura visited sites throughout the state, including the Morikami Museum and Japanese Gardens (tour/food exchange), attend a dinner hosted by the Consulate General of Japan, toured the Everglades National Park, participated in a meeting with the Miami Beach Chamber of Commerce Women’s Business Council, toured the Mission San Luis in Tallahassee, attended a dinner at the Governor’s Mansion and participated in a ribbon cutting ceremony inaugurating a photography exhibition on Wakayama at the University of West Florida-Japan House in Pensacola. Florida First Lady Columba Bush visits Wakayama with a delegation of 14 people, including 2 high school students, for the 3rd First Lady Project. They met with the Wakayama Chamber of Commerce and Industry Businesswomen’s Club, visited the Elementary School affiliated with the Wakayama University Education Department, and visited the World Heritage Koya and Kumano areas. The high school students also participated in artistic exchanges with students from Wakayama High School. Clara Garcia Mclean, a modem artist from the Artcenter/South Florida in Miami Beach, visits Wakayama. She works on and displays artwork at the Prefectural Guest House, the Wakanoura Art Cube and other places. Shawnea Dawn Tallman, a teacher from Niceville High School, visits Tanabe Commercial High School on the Japan Fulbright Memorial Fund Teacher Program. A three-person delegation including Morris Marx, former president of the University of West Florida, visits Wakayama. Mary Palmer, Executive Director of the Florida Alliance for Arts Education, and one other visit Wakayama. They visit Wakayama University and the Elementary School affiliated with the Wakayama University Education Department. Assistant Professors from the Education Department of Wakayama University, Etsuko Higashi, Ayako Nagatomo, and one other, visit the University of West Florida . Florida Secretary of State Glenda Hood visits Wakayama with a delegation. Two overseas students from Wakayama University spend nine months at the University of West Florida . Governor Kimura heads a five person government delegation and visits Florida with two students from the Taiko drum club of the Misato branch school of Taisei High School and an accompanying teacher for the 2nd First Lady Project. The group was honored at an event at Walt Disney World's Epcot Center to highlight the Sister-State Youth Art Exchange Program. The group visited the Kennedy Space Center and DeLand Museum of Art. Ken Atelier One, an artist group from Wakayama have their paintings exhibited at the DeLand Museum of Art. The late Mafune Yamamoto’s calligraphy works are also put on display. Twelve people visit Florida for the tape cutting ceremony. Richard Fernandez, a teacher from Niceville High School, visits Tanabe Commercial High School on the Japan Fulbright Memorial Fund Teacher Program. 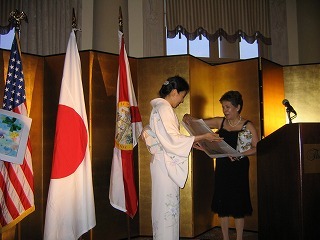 A two-person delegation from Wakayama Prefecture is sent to participate in the first Florida-Japan Summit (Delray Beach). Dr. John Cavanaugh, president of the University of West Florida and Dr. Morris Marx, president emeritus of the University of West Florida (total of five members from Florida) visit Wakayama University and discuss future international exchanges. Dr. Kei Adachi, professor of Systems Engineering of Wakayama University, Professor Tomotsune Honda and Professor Tsuneo Ajisaka accompanied by one other person visit University of West Florida. JoAnn Morgan, member of the University of West Florida Board of Trustees, visits Wakayama University . International Exhibition of Florida’s First Lady’s Art Project in the Wakayama Prefecture Citizens’ Culture Hall. Jerry Cartwright, State Director of the Florida Small Business Development Center Network, has a meeting with people in the business and economics related field in Wakayama Prefecture. Miami Beach High School’s Classical Guitar Ensemble group comes to Wakayama and gives a performance at Wakayama Prefectural Guest Hall. Dr. Morris Marx, president of the University of West Florida, and other university representatives visit Wakayama University Carl Backman, Vice Provost and Associate Vice President of Academic Affairs of the University of West Florida, gives a special lecture at Wakayama University . Wakayama International Exchange Association sponsors an Experience Florida Tour (12 people participate) in order to commemorate their 10 anniversary and also the 5 year anniversary of sister state ties. As part of the events to commemorate the 5 year anniversary of sister state ties, two Noh performance artists, Akira Matsui and Richard Emmert go to Florida to give a lecture on Noh. Professor Rick Harper of the University of West Florida comes to Wakayama University and gives a lecture. At the same time, Professor Michael Yots also visits Wakayama University to discuss and exchange opinions on the exchange student and research program. As part of the events to commemorate the 5 year anniversary of sister state ties, Hakuzan Kubo, the head of the Noh Mask Culture Association, goes to Florida to give a lecture on Noh masks. In order to commemorate the 5 year anniversary of sister state March 2001 relations, the “The Face of Drama: Contemporary Noh Masks by Hakuzan Kubo” is exhibited in Delray Beach, Tampa, Tallahassee, Pensacola, and Coral Gables, Florida with the support of the Noh Mask Culture Association (Wakayama City). A student from Wakayama University goes to the University of West Florida to study abroad for 10 months. 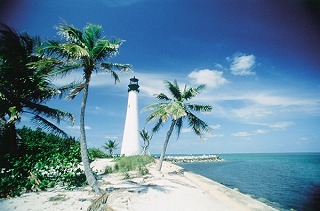 Wings of Women, a delegation of 22 women, visit Florida and examine an organization related to senior citizen policies. Shunji Moriya, president of Wakayama University, and two other people visit the University of West Florida . University of West Florida (5 students, 5 faculty members) visits Wakayama University. Beryl Roberts, State of Florida House of Representatives, comes to Wakayama as a Japan Society Local Government and Public Policy Fellow and attends various workshops and seminars within Wakayama Prefecture. Wakayama University and University of West Florida complete exchange student agreement. A group representing Wakayama Prefecture attends the International Days 2000 Conference in Tallahassee. Dr. Albert Canas of the University of West Florida visits Wakayama University to discuss joint research projects between the two universities. Dr. Morris Marx, University of West Florida president, and 6 other people come to Wakayama. The University of West Florida and Wakayama University sign a Sister School Agreement. Eight members of the Wakayama Prefecture Youth Agriculture Study Abroad Program visit and take a tour of Florida. Bill Pfeiffer, Assistant Secretary of State, Dr. Gaylen Phillips of the Florida Department of State Division of Cultural Affairs and the Howard W. Blake High School Jazz Combo visit Wakayama Prefecture . The Jazz Combo performs at the Experience Nanki-Kurnano Exposition held in Southern Wakayama. Dr. Glen Goltermann, Co-Director of the Jikei-American Center at the University of West Florida visits Wakayama Prefecture and Wakayama University. Carl Backman, Vice Provost and Associate Vice President of Academic Affairs of the University of West Florida visits Wakayama Prefecture to discuss possible Sister School ties with Wakayama University. Six students from south Florida area high schools study at Kinki University High School. Wakayama Prefecture International Exchange Association sends 15 Yuzaki Lion Dancers to Florida as a Cultural Exchange Group and the group performs in Pensacola, Panama City Beach and Miami. Sandra Mortham, Florida Secretary of State, visits Wakayama Prefecture . Nine members of the Wakayama Prefecture Youth Agriculture Study Abroad Program visit and take a tour of Florida. Sixty-nine members of the Wakayama Agriculture Pension Association visit and have agriculture tour of Florida. Charles Ranson, Vice Chairman of the Florida International Affairs Commission visits the opening of the World Tourism Forum in Tanabe City and Shiraharna Town. Singer Del Suggs accompanies him and performs at the opening of the forum at the Kinan Culture Hall. Wakayama Prefecture and the State of Florida sign a Sister State Agreement at the Wakayama Prefecture Government Office. Invitation of the Cypress Gardens Southern Belles to the World Resort Expo in Wakayama made possible through the cooperation of the State of Florida Government. A group representing the Florida State Government attends the opening of the World Resort Expo in Wakayama Prefecture. Meeting in Osaka between Florida Governor Lawton Chiles and Mr. Nakanishi, Director General of Wakayama Prefecture Governor’s Office. Wakayama Prefecture International Exchange Association officials make a visit to the State of Florida office in Tokyo.